Sometimes, I am thankful that I live in Southern California. You would think that most of those times would be in the winter, but no! I’m much happier here in the summer than I was on the East Coast, because it gets really hot and humid really easily. So, in honor of the recent heat wave I didn’t have to deal with, I give to you The Summer Sun. I was recently in a soda shop searching for ingredients for another, upcoming drink, and I happened across a bottle of sweet corn flavored soda. And I figured, well, why not? (This was after deciding not to buy the buffalo sauce or ranch dressing flavored drinks…) After a few sips, I quickly decided that it was so sweet and so corny that I needed to cut it with something. I looked around, and what did I find? Whiskey! Hurray for whiskey! The following drink is what came out of it. You’ve got corn for the summer, and chili for the heat. Now, I don’t expect anyone really to be able to make this, since sweet corn soda is probably pretty rare, but it was a nice departure from the usual. Good luck, East Coast! Chill out. Another easy one. 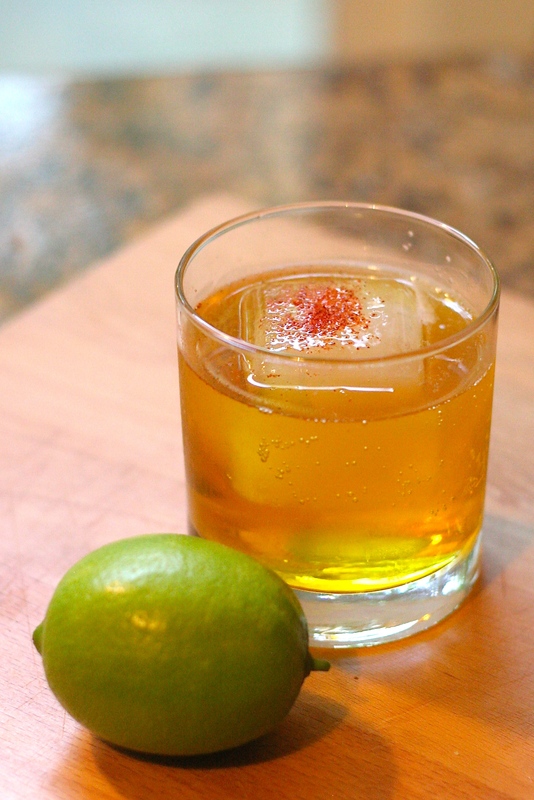 Pour the whiskey over ice into a rocks glass, put in the lime, fill up the rest of the glass with soda, and add the cayenne. Depending on your soda, the proportions could vary widely (I put a lot of the lime and chili in because the soda’s flavor was so overbearing.) So, to taste! Partner in Crime: I don’t really like whiskey or that soda, but together it actually worked pretty well!